Product is good quality, reasonably priced and also had the size I needed. The only downside with this and other rings is that they only have half sizes so you need to do a little working around which will fit you best. 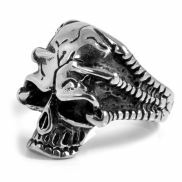 Skeleton head or more simply skull rings are some of the most impressive pieces a man can wear on his hands. 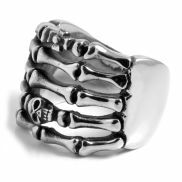 All of our skull rings are made of high quality 316L surgical steel. Our drop menus help you filter or sort on colour, pricing and latest arrivals. This category is dedicated to men that want a very masculine ring. The majority of rings in this category feature depictions of skulls in many different designs. As a rule, skull rings are larger than standard rings because of their elaborate designs. 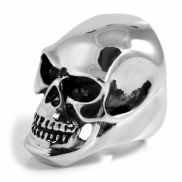 All of our main skull rings are cast in one piece of solid polished steel and therefore have no joints. Some designs feature zirconia stones and others have dramatic black highlighting that emphasizes the details of the skull. All the rings in this category are made from 316L stainless steel, mostly referred to as surgical steel. Steel is a heavy metal, has great strength and is the perfect material for these very macho men's rings. All of our steel rings are tested nickel-free following EU standards that stipulate the metal transmits less than 0.5 micrograms of nickel per cm2 per week. Steel always contains bits of nickel so for those who suffer from allergic reactions to nickel, we recommend instead titanium rings. Titanium rings are in fact totally nickel free perfect for those with nickel sensitive skin. What is your ring size? At Trendhim we show the inner circumference in mm, the US and the UK size for the rings we offer. For example, weâll show ring size 62 / 10 / T Â¹/â, which means the ring has a circumference of 62mm, US ring size 10 and UK ring size T Â¹/â. 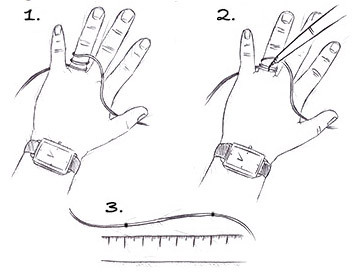 Below you can find what we consider the most accurate way to measure your ring size at home. 1. Wrap a thin cord around your finger two times. 2. Then draw a straight line over the cord. 3. Measure the mm amount from dot to dot, that will determine your ring size. Note: It is crucial that you are very accurate with this method.